Building and leading a Series B company requires the founder/CEO to quickly evolve and develop new skills. 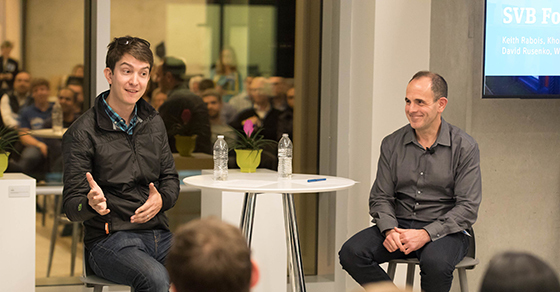 Silicon Valley Bank invited Weebly Founder and CEO Dave Rusenko to share his tips for growing into the role and asked Khosla Ventures’ Partner Keith Rabois to share his perspective on scaling a Series B company. Read on to get their advice. And read this related article on how to prep to take a company from Series A to Series B. Getting a check doesn’t guarantee success as a Series B company. You have to earn success by executing. Building and leading a Series B company can be extremely difficult: For one reason, it requires the founder/CEO to quickly evolve and develop new skills, literally almost overnight. Dave Rusenko, founder and CEO of Weebly, says the Series B experience for him was comparable to going from flag football to tackle. “It’s critical to improve yourself, and invest in yourself,” he adds. Silicon Valley Bank invited Rusenko to share his advice as a founder and investor about how to be a successful Series B CEO and asked Khosla Ventures’ Partner Keith Rabois to provide the investor’s point of view for scaling a startup. While each company may be different, a magical threshold for scaling appears when you reach about 25 employees. For that reason, Rusenko subscribes to the ‘lean is mean’ mantra: “You want to stay under 25 FTEs until you’re confident you’ve found product market fit, because everything really starts to scale once you cross that mark.” Rabois agrees that, from the investor perspective, he wants his companies “to consciously decide when to cross the threshold.” This is the time to find people with strategic and leadership skills to help you. SVB analysis of cap tables illustrates why it’s important to be prepared for scaling quickly. The number of shareholders on the cap table often correlates with headcount as a company grows and scales. This table underscores how fast companies grow between rounds, doubling shareholders from Series A to B and again from Series B to C.
While often overlooked, a top hiring priority should be to find someone with financial planning and analysis (FP&A) experience. SVB analysis shows that technology companies raising their Series B rounds over the past six years had median operating expenses 120% higher, or more than double, their revenues. In comparison, Series A expenses were 145% higher than revenue. Rusenko and Rabois advise keeping headcount low until you are really ready to scale. Should you have a gap, lean on a board member. Rusenko also takes a unique approach by hiring managers who are “able to see around the curve,” but also are willing to spend a few months “rolling up their sleeves.” For example, he asked a VP of engineering candidate to work as an engineer for a few months before taking on the lead role. Anyone who believes in the company realizes they will make up for any lost time quickly, he says. Rusenko believes Series B is the time to get honest with yourself. The founder/CEO role will be changing dramatically, and you will be tested in ways you cannot imagine. He once was on a panel with former CIA Director George Tenant, who offered up his theory on delegation: “I don’t mind if you bang up the ship a little bit, but if you think you’re going to put a hole below the waterline, you come tell me first.” First learn to delegate work, then learn to delegate decisions. Jake Moseley is the Senior Market Manager for Silicon Valley Bank's National Fintech Practice and Northern California region. Jake Moseley is the Senior Market Manager for Silicon Valley Bank's National FinTech Practice and Northern California region. He is responsible for the leadership, client relationships, sales and risk management for SVB’s core constituency of venture-backed and independent technology companies in the region, as well FinTech companies nationally. Jake has more than 15 years of experience working with technology, life science, clean tech, private equity and venture capital clients worldwide. Prior to his Market Manager role, Jake was a Global Senior Credit Officer for Silicon Valley Bank taking primary responsibility for the loan approval and risk management for SVB’s lending activities in the UK and Israel, as well as within the payments space. Jake previously served as Head of Commercial Banking at Silicon Valley Bank’s UK office. In this role, he helped establish the bank's UK branch in June 2012, and led the sales and marketing teams in the region.